Matt Kuchar holed a 25 metre bunker shot to birdie the final hole for a one-shot victory over Luke Donald at the RBC Heritage on Sunday. 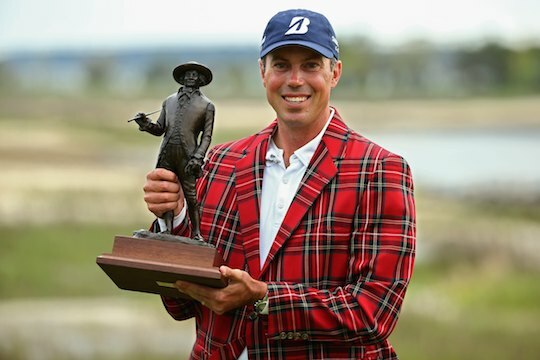 It was Kuchar’s seventh career PGA Tour victory and in the process he collected US$1.044 million in prize money and has moved to number five in the world. During Sunday’s final round, Kuchar erased Donald’s four shot lead with seven birdies in his first 10 holes. Then Kuchar nearly let the tournament slip from his fingers again when he three-putted from less than 8 feet at the par-3 17th. The bogey dropped him into a tie for the top spot and set up the dramatic finish at the 72nd hole. Kuchar ranked 124th on the PGA Tour in sand saves, converting less than 47 percent, isn’t a renowned bunker exponent so when he holed the shot he certainly let his emotions out as he fist pumped into the air with jubilation. “I wish it wasn’t that great a finish, but I made it that way after 17,” he said. Leading up to this victory, Kuchar had spent a month of Sundays with a chance to claim a PGA Tour title, only to come up short each time. Kuchar was two strokes behind winner Steven Bowditch at the Texas Open, lost in a playoff to Matt Jones’ 42-yard chip-in on the first extra hole in Houston the next week, then was tied for the lead at the Masters last Sunday before four-putting the fourth hole and finishing tied for fifth. “It’s amazing to have four straight weeks of changes on four completely different golf courses,” said Kuchar, who now has eight top-10′s in eleven starts this season. Donald had two holes to play after Kuchar finished, but he missed a 28-foot birdie putt at the 17th hole, then missed his birdie chip at the last to fall a shot short of forcing a play-off. “Finishing second isn’t what I was hoping for,” said Donald. Kuchar moved up one spot to fifth in the latest Official World Golf Ranking following the win to be at his highest ranking since he was fourth place following his win at the 2013 Memorial Tournament. The leading Australian was Stuart Appleby who tied for 12th with Robert Allenby the next best Aussie at 23rd position followed by Geoff Ogilvy in 27th position.